If you are assisting a child or teenager with starting an aquarium, be sure to do your homework so they aren't set up for failure. Here's how to make the right choices. Prior to shopping, make a checklist of things you need so you won't miss anything or purchase unnecessary items. Print off this checklist with recommendations for aquarium gift giving; it has everything you'll need on one list. For beginners, a 20-gallon tank or larger is ideal. If space or finances make that impossible, don't go smaller than 10 gallons and take care to select small, hardy fish. Should you select glass or acrylic? Acrylic has many advantages for children, since it does not chip or break, weighs less than glass, and doesn't distort the view as glass can. That's important, as children will spend a lot of time gazing at their tank from all angles. On the downside, acrylic scratches easily and it is more expensive than glass. If the price is not an issue, strongly consider an acrylic tank. You won't have to worry about the tank being broken by an errant baseball or other flying toy. Children and teenagers often want brightly colored gravel and decorations. However, this kind of decor is not a natural setting for the fish and can be stressful for them. Rather than take the choice away from your child, discuss what the fish's home in nature is like. Point out that where fish live in their natural habitat, they don't have red gravel or bright blue plants. Now comes your biggest challenge, as new aquarium owners, young and old alike, want to get lots of fish as soon as possible. Fish should never be purchased on the same day as the tank. Adding too many fish too soon and overfeeding them are the biggest mistakes new owners make. It's critical to set up the tank, let it run for a day or two to stabilize the water temperature and ensure everything is functioning properly before fish are added. Note: This initial waiting period is not the startup-cycle; that doesn't begin until fish are added. 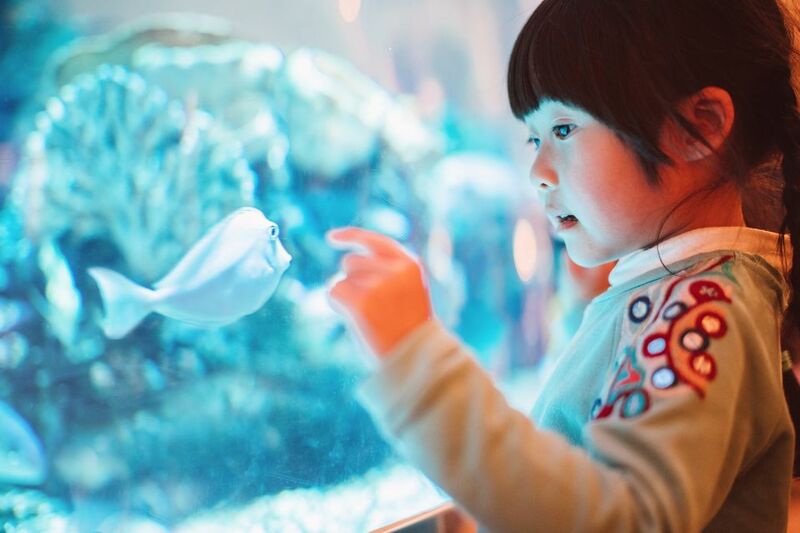 During the time you allow the tank to stabilize, sharing some basic facts about aquarium wastes will help eager children wait for their new fish. Tell elementary age children that fish go to the bathroom in the water they live in, and wastes can harm the fish. Explain that special bacteria get rid of those wastes, but the bacteria take several weeks to grow enough to do the job. While they are growing, it is important to only have a few fish in the tank and change the water often to get rid of the wastes. Middle school and high school students are capable of understanding the nitrogen cycle as it occurs in an aquarium; take this opportunity to teach them about it. Too many aquarium owners are unaware of this critical process, and as a result, they lose fish. Once your tank is ready for fish, talk about fish choices with your children. Avoid large or aggressive fish or those that are difficult to care for. Select a couple of hardy starter fish before going to the store. Matching pH of Aquarium Water: Will It Keep Fish Happy? Why Use Plastic Plants in Your Aquarium When You Can Use Real Ones? What is the Best Equipment for Aquarium Water Movement? How Are Aquarium Fish Artificially Colored? Learn how to create a happy, healthy home for your pet. The Spruce Pets is part of the Dotdash publishing family.